This affordable, high quality, solid state GaAs amplifier is designed for multi-purpose use in the wireless markets. 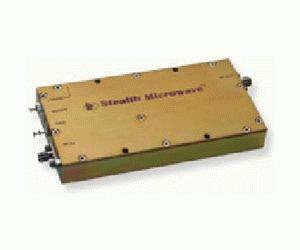 With 1 GHz of bandwidth, this small amplifier can be used in DCS1800, ISM, WLL, PCS and MMDS applications. The unit uses the latest surface mount technologies to provide numerous features, while maintaining a minimal size. Two versions are available, the -37, with 20 dB of linear gain, and the -37H, with 33 dB of linear gain. Features include a Single DC Supply, Over/Reverse Voltage Protection, Thermal Protection with Auto Reset, and Logic On/Off Control. An optional Harmonic Filter is available.